her principal, Administrator of the Year Dan LaFleur. DERRY -- Teachers and parents at Ernest P. Barka School will tell you they have some of the best people around. But at the recent 97th annual New Hampshire PTA Convention in Nashua, the statewide parent-teacher organization agreed, awarding the elementary school several of its top honors. Barka Principal Dan LaFleur was named New Hampshire Administrator of the Year at the Nov. 12 ceremony, and Barka’s PTA was honored as New Hampshire PTA of the Year. “We’re very proud of the Barka community and the way everybody works as a team,” said Terri Stallings, co-president of the school’s PTA, on Tuesday. Barka PTA’s executive board is made up of all new members after some overturn last year, Stallings said, so the award has special meaning for the young board. “We were a little nervous because we started off fresh with some help from our old board,” she said. “None of us even knew each other and now we’re very good friends. We work well together, and I think that shows.” Stallings said the group made extra efforts to bring in new programming, like father-daughter and mother-son dances, and expanded programs like the school’s Angel Fund to assist students in need and their families. Co-president Aimee Fahey said Principal LaFleur’s role also makes a big difference in bringing a thriving group of parents and teachers to the group. Fahey said LaFleur attends every PTA meeting, along with at least one faculty representative from each grade level and subject. And with that kind of support from teachers and parents alike, LaFleur said the Barka community stands out. 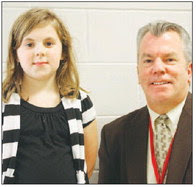 Fourth-grader Mackenzie Savard was also recognized with a N.H. Student Volunteer of the Year award at the convention, honoring her work raising money for various local charities. Mackenzie, who most recently has been selling homemade cat toys and dog bones to benefit the Salem Animal Rescue League, said she just enjoys helping others. “It makes me feel good because I know people need stuff and I like helping them,” the 9year-old said. Louise Duys, a third-grade teacher at Barka, was also given an honorable mention for the NH PTA Partner of the Year award for her work with the school’s Relay for Life and Angel Fund programs.